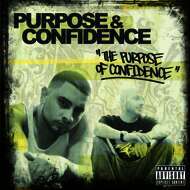 Purpose, founding member of the group Tragic Allies, teams up with extraordinary producer Confidence of Rashad & Confidence fame to bring you their debut album "The Purpose of Confidence". While these two artists come from different backgrounds, the sounds they put together can only capture the essence of pure hip-hop. The mixture of music takes you in different directions from story-telling, real world situations and lyrical onslaught. Purpose's flow, delivery and lyrics will have you engaged from start to finish while Confidence delivers on the boards as usual. This time, he switches it up to help compliment Purpose's subject matter but still providing his soulful and hard hitting trademark boom-bap sound along with more gritty beats as well. Listeners will be in for a nice surprise as these two artists help shape the landscape of hip-hop and keep that raw and authentic music pumping through your veins.